Huge online collection of sponge cords, rubber cords and foam strips. 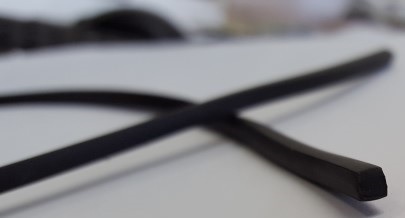 U-Channel extrusions suitable for rubber door seals, car door protectors and rubber edge trims. Cut to size in a variety of diameters to suit your application. Rubber adhesives available for durable bonding. Resistance to petroleum oils, minerals and vegetable oils. Suitable for most common alkalis and acids. FKM (Viton®) cords offer an excellent resistance to wide variety of corrosive fluids at extreme temperatures. Withstand atmospheric conditions; ozone, sunlight UV ageing, moisture, EPDM Rubber Cord is most suitable. Extreme temperatures -40°C to +200°C. Good arc and carona resistance and electrical insulation properties. Neoprene sponge cords are ideal for outdoor use or applications requiring resistance to UV rays, air and ozone. EPDM rubbers engineered to withhold their cellular structure, various applications involving resistance to ozone and weathering. Adhesive allows you to join cords to create o-rings. Polymax's TPE clamping profiles are perfect for car bodies, door & window gaskets, verandas & glass houses, where a good grip is needed. Resistance to petroleum oils, minerals and vegetable oils. Suitable for most common alkalis and acids. Temperatures -20°C to +80°C..
Rubber cord Splicing kits in NBR Rubber ideal for creating your own O-rings.